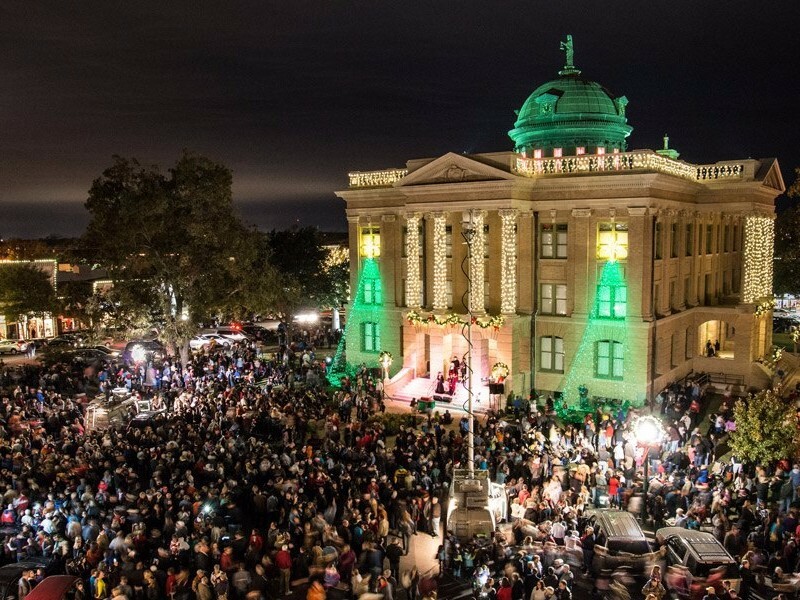 Come enjoy one this city’s most beloved traditions, the annual Lighting of the Square in Georgetown, TX, on November 23rd (the Friday after Thanksgiving). Experience the magic, and kick off the holiday season with your family and friends by singing along with the Austin Carolers to your favorite holiday tunes, enjoying refreshments provided by local vendors, and watching the Square light up! The event will be held on the east steps of the historic Williamson County Courthouse located at 710 S. Main Street. Festivities begin around 5:30 p.m., and at approximately 6 p.m., join Georgetown Mayor Dale Ross and Williamson County Judge Dan Gattis as they help Santa count down and flip on the holiday lights of The Most Beautiful Town Square in Texas! The lights are supported by Georgetown Utility Systems, and like the rest of the city, will run off of 100% renewable energy. This event is free to the public! Local shops surrounding the Square will stay open late, so make sure you plan enough time for some holiday shopping to find unique gifts you won’t find anywhere else. Families with children can also stop by The Williamson Museum to make a craft stick ribbon tree and listen to live music from Evelyn Billington. This is also free to the public! Williamson County Brown Santa will offer photos with Santa inside the courthouse after the lighting event from 6:30 to 8 p.m. for a $10 donation benefitting the program. Be sure to enter the courthouse on the south side on Eighth Street. Toy donations to Williamson County Brown Santa and the Georgetown Police Department Blue Santa are encouraged at the event. Representatives from both organizations will also be on-site to accept applications from families that wish to receive gifts this year. Blue Santa is a program sponsored by the Georgetown Police Department that provides toys to more than 1,500 Georgetown children during its annual toy drive and distribution. The Brown Santa program sponsored by Williamson County provides gifts to children of families living outside the geographical city limits of any town or city that does not provide a similar program within Williamson County. Both organizations strive to make Christmas brighter for children in need! Celebrate a New ‘Life Without Limits’ in Gardens at Verde Vista This Holiday Season! A new ‘Life Without Limits’ in luxury, low maintenance garden home or villa at Gardens at Verde Vista will allow you more time than ever to spend cherishing every moment of the holiday season with family and friends! Plus, get your choice of a free outdoor kitchen or wood floors (in main living areas) if you contract to build a new home in November. Schedule your private tour of our model and move-in ready homes, brand new private Amenity Center, and Final Phase of beautiful Hill Country home sites today!